For over half a century it was a truism among Palestinian refugees that those areas of Palestine where British Mandatory authorities had surveyed, thoroughly investigated, and registered the ownership rights were the same areas that came under Israeli control as a result of the 1948 Arab-Israeli War. Those areas that had not been surveyed and registered—a process called “land settlement” by the British—escaped depopulation and Jewish control, thus remaining under Arab control after 1948. So deeply ingrained was this belief, this fear, that surveying and land settlement represented the first steps toward eventual Israeli control of land that members of a later generation of Palestinian landowners were known to dig up the iron boundary markers placed in West Bank villages by Jordanian surveyors in the 1950s for fear they could lead to alienation from their land. Some Palestinian refugees even feared that Jordanian land settlement operations underway near Amman as late as the 1970s might somehow facilitate an eventual Israeli takeover of their land in Jordan! Beyond this popular perception, scholars have investigated the connection between British land policies in Palestine and Zionist land purchases and, eventually, Israel’s victory in 1948. No scholar has disputed that British surveying and land settlement policies made Zionist land purchases easier. However, the wider question of whether or not British authorities did this purposely to facilitate implementation of the Balfour Declaration, or whether British land policies were just another iteration of standard colonial practice designed to increase production and generate revenue, has in fact been the subject of debate. Three names emerge as central to the debate about the British, the Zionists, and land policy and conflict in Palestine. Dov Gavish has argued, based on a close reading of the archival records, that Zionist needs were the driving force behind British land policy in Palestine. On the other hand, Martin Bunton has argued, based on his own thorough research, that development and fiscal needs were what drove British land policy during the Mandate, at least through 1936. For his own part, Kenneth Stein has argued that problems within Palestinian society itself, including sale of land to Jews, were inter alia responsible for the loss of the Palestinians’ patrimony. With her new book, Aida A. Essaid has made a worthwhile entry into this debate over Mandatory land policy and the related question of the aims of British land policy. Essaid, who works at the King Hussein Foundation in Amman, conducted the research for her book while pursuing doctoral work in the department of politics at the University of Exeter. 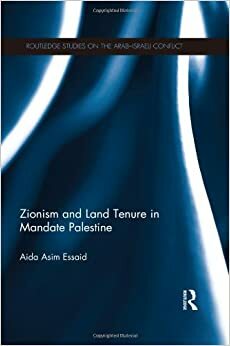 Her book’s conclusions align closest to Gavish’s thinking, arguing that the Mandatory government “allowed Zionism to take an active and collaborative role in every stage of the land tenure system…” (p. 15). As a result, Essaid believes that Zionism then used the resulting system to acquire the land needed for a Jewish state. The author arrives at this conclusion by way of an intricate, archives-based study of the legal framework and of British land policies that were promulgated in Palestine during the Mandate. She also offers a detailed examination of land tenure in three villages chosen as case studies. The source of information about those villages was derived from a hitherto unutilized source: British “land settlement” records from Palestine that came into the hands of the Jordanian government during the 1948 Arab-Israeli War, and that have been hidden away from public view at the Jordanian Department of Lands and Survey in Amman for over sixty years. Although there are many strengths to this book, unearthing and researching those documents alone makes this book unique and immensely valuable. Essaid’s work is a major contribution to our understanding of several related fields of inquiry: overall land tenure in Mandatory Palestine, British legislation and land policies, and Zionist participation in the creation of such laws and procedures. Essaid’s spadework also sheds impressive light on certain heretofore unknown factors that contributed to Zionist acquisition of Palestinian land. For example, her three village case studies reveal that one of the greatest methods of such acquisition came through the land settlement process, particularly the partition of collectively-owned (musha‘) lands into individual parcels in the 1930s, not sales by small Palestinian landholders. Despite a few typographical mistakes and some less-than-felicitous syntax and organizational problems related to transforming a dissertation into a book (all of which the editors should have caught), Essaid has produced a milestone work on land, British rule in Palestine, and the transformation of Palestine during the Mandate that is sure to generate debate. Michael R. Fischbach is author of State, Society and Land in Jordan and Records of Dispossession: Palestinian Refugee Property and the Arab-Israeli Conflict.